My name is Michael Mandis. 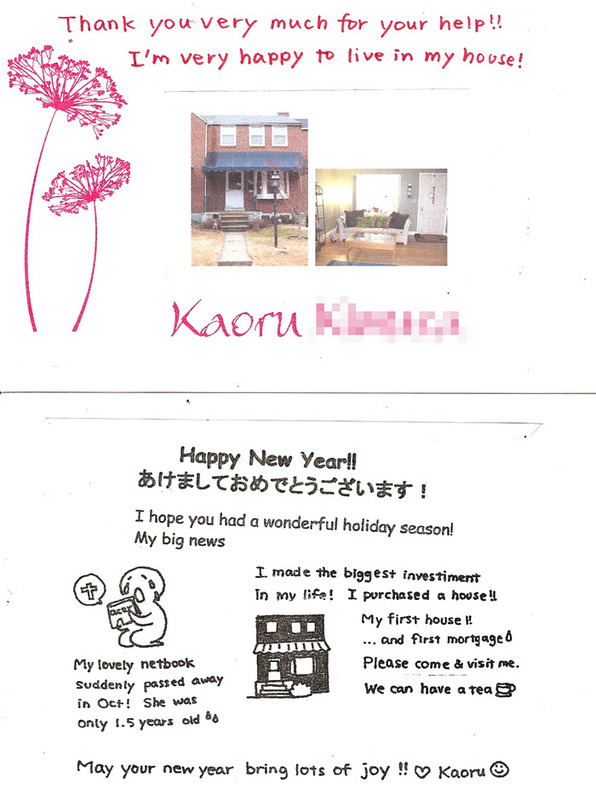 I’ve been helping people get the homes they want - and the mortgages they need - in Maryland and Pennsylvania since 1993. Whether you’re buying a new home or refinancing your current mortgage, this site is one of the last steps in your journey. Here you’ll find the best, clearest free info on Maryland home loans, and you can hire my team at Alliance Mortgage funding to help you get the best loan possible. Besides our ability to get clients the most affordable mortgages, what our clients love most about Alliance Mortgage Funding is how stress-free we make the mortgage process. That’s because of our experience. My team has over 61 years of combined experience. If you picture every home loan we’ve secured as a house with a yard and a driveway, we’ve already filled up a large town or small city in Maryland with happy, financially secure homeowners. We know how much work the mortgage-hunting or refinancing process is. If you’re tired of searching and researching, read our clients’ reviews so you know what to expect, and contact Alliance Mortgage Funding today. We’ll handle the hard work on getting your home loan, so you can focus more of your time on enjoying your Maryland or Pennsylvania home. Contact us online or call us at (410) 683-1500 for a free, no-obligation Mortgage Planning Session today. Our office is in Cockeysville is only 20 minutes north of downtown Baltimore. Many of our clients live in greater Baltimore - from Glen Burnie to Towson to Ellicott City and everywhere in between - but they come from all over the state of Maryland and Pennsylvania. Homeowners in this part of the country love that we focus on them. They’ve written over 100 online reviews of Alliance Mortgage Funding, on sites like Yelp, Google, Zillow, BBB, Angie's List, Facebook, or Kudzu (Best of 2012). But please look past our 5-star ratings: we hope you also take at least a few minutes to read exactly what those reviewers say about working with us. We have helped homeowners in your situation before, and we would love to help you, too. Although we’re known for making the home-loan process easy and stress-free by guiding clients through every step, it’s worth making sure you know the basics before making the biggest investment of your life - if only for your peace of mind. 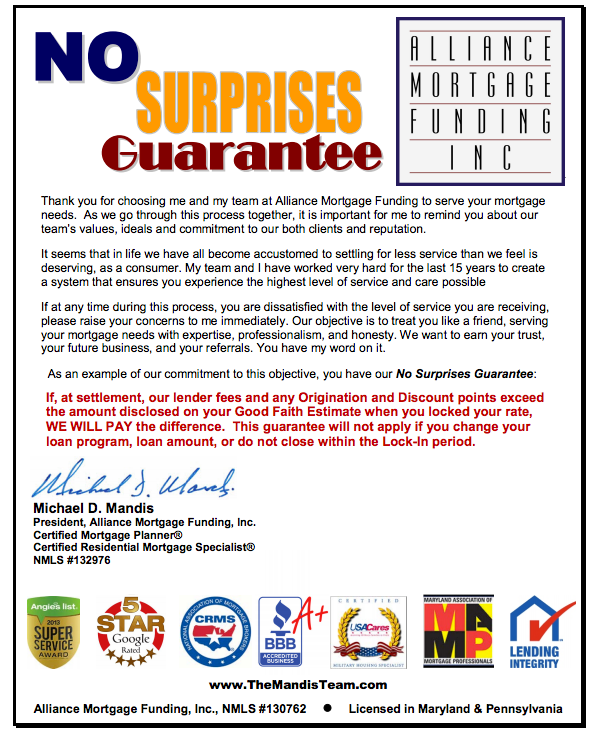 One of our favorite testimonials from a client ends with the statement, “It felt like you held my hand, right up to my new front door.” Our goal at Alliance Mortgage Funding is to make sure you feel the same way. You can get pre-qualified for your loan by filling out our secure online application now. You don’t have to fill it out now, but it can help us get you the best mortgage even more quickly. please contact us online or call us at (410) 683-1500. We look forward to helping you get the mortgage you need for the Maryland or Pennsylvania home you want. 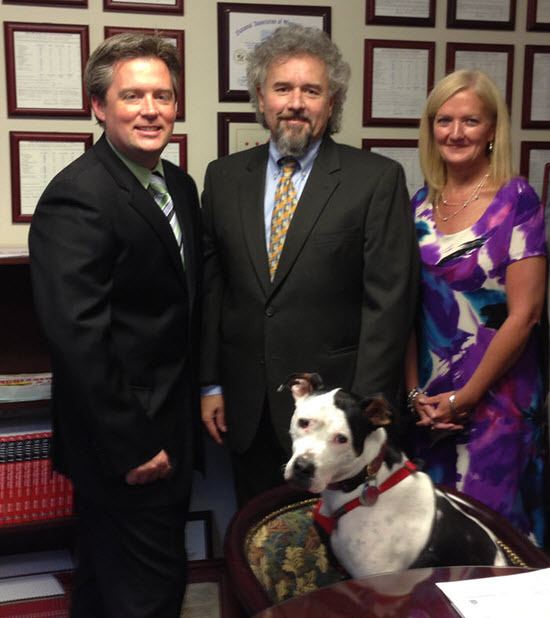 We service clients statewide, including every city and town in Maryland. "Mike has been my trusted mortgage source for my entire adult life (through two home purchases and a refinance), and has always been completely honest and forthright in our interactions. His team is truly interested in providing top notch service worthy of my personal endorsement to closest friends and family members. I look forward to working with Mike again in the future, and would highly suggest providing his team the opportunity to serve you if you're in the market to utilize their services. 5 Star, A++ all the way with The Mandis Team!" "Mike Mandis and his team helped me as a first time home buyer. They were there every step of the way to help guide me in that stressful process. Now I am looking for my next home and Mike has been a great help. He is always quick to respond. He is a great resource and will help you in any way that he can. I will use Mike and his team for all my mortgage needs!" " Excellent company! Great communication, I could not have had a better experience! 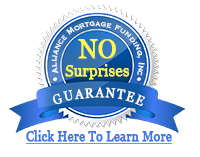 I highly recommend alliance mortgage to anybody !" 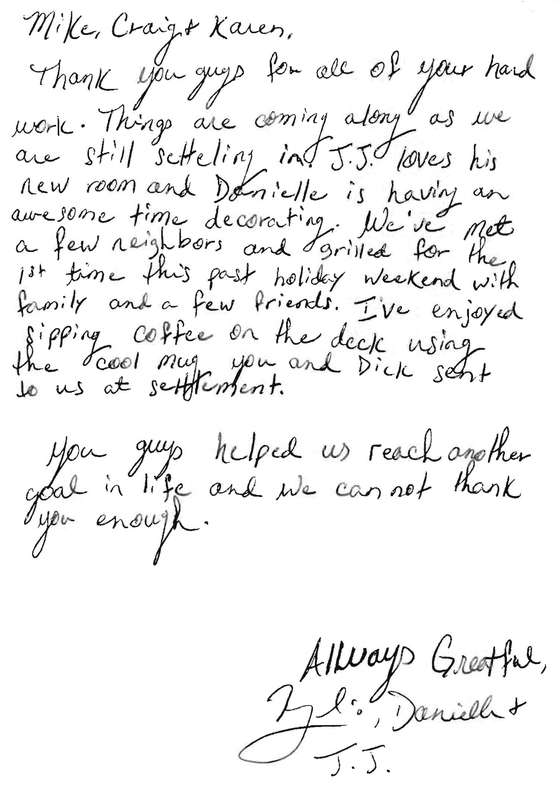 "Mike and his team went above and beyond for me. They helped me through the entire process and are the ONLY place I will go when buying a home. They walked me through answering every question and when I needed it most he and his team did EVERYTHING they could to help me. If there was a 6th star I would gladly give it!" "Michael and his team have been kind, honest and a pleasure to work with. Being a home buyer in this economy is scary enough as it is and to worry about dealing with lenders that are anything but honest and only about the bottom line make it even scarier. Michael and his staff did everything possible to make it easy to understand, make sure that we were comfortable and they were honest every step of the way. 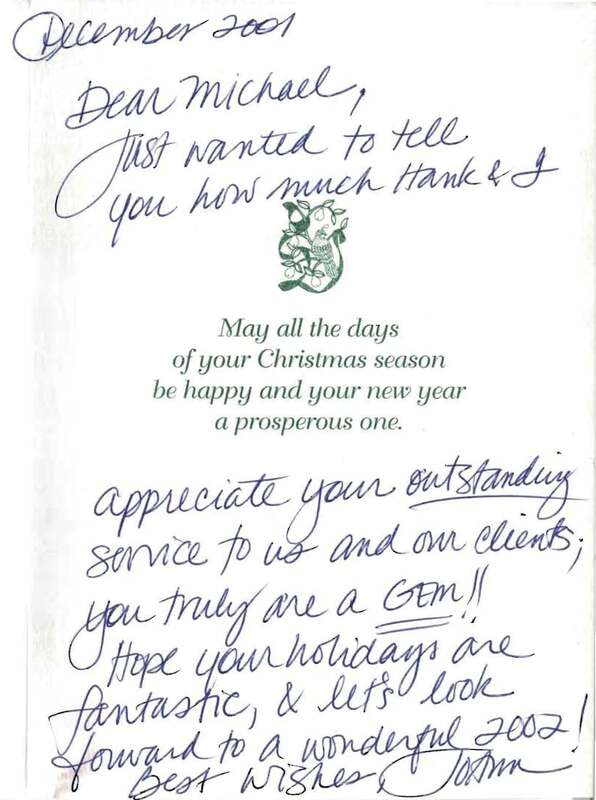 It's rare to find a lender who truly serves their customers and Michael is definitely that person. I cannot say enough positive things. We will be coming back for the rest of our lives and referring everyone we know because piece of mind in this day and age is priceless!!! Thank you Michael!!!!! Sincerely, Heather Sarandos"
"Mike and Team, This message of appreciation is long overdue. I know my situation was somewhat unique and difficult in finding out for what type of financing my home was qualified. Your efforts were beyond appreciated and it is no exaggeration to say that without your help I would not be living where I am now. 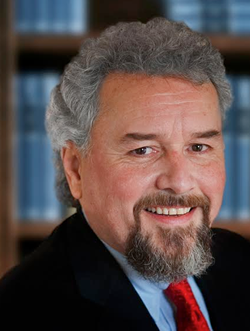 Mike, your professionalism, expertise, and attentiveness is unparalleled. You and your team were always available to answer questions and keep me updated with the latest developments. I never had to wonder what was going on or what would happen next. The feeling of comfort that comes with having people you know are truly looking out for your best interest is indescribable. A simple thank you is nowhere near sufficient but please know that I value all that you and your team did for me. -Levron Schuchalter"
I was referred to Mike Mandis at Alliance Mortgage when I was buying my first home over 15-years ago. Since then, I have used them again and referred them to family and friends. Friendly staff, responsive, and they do what they say they are going to do without the drama and headaches usually associated with getting a home loan. Highly recommended.